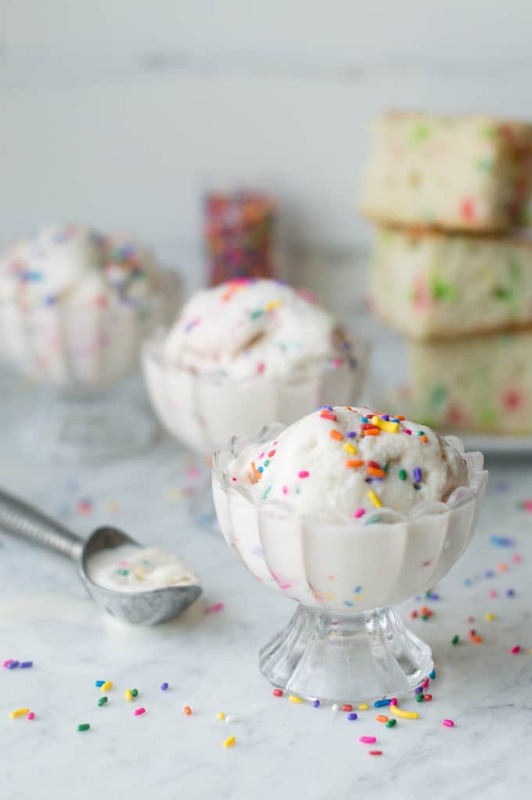 Birthday Cake Ice Cream is an indulgent sweet treat that is sure to bring out the kid in you. Keith and I were both summer babies. Perhaps this fact explains our shared love for all things related to the warmest months of the year: sunshine, baseball, cookouts, and ice cream. I was born on Memorial Day, the unofficial “beginning” of summer, while Keith came into this world on a balmy day in August. We love to celebrate birthdays at our house, and we have several special ones that occur during the sun-filled summer months. Our celebrations always include a special meal out, a planned activity (like a day at the ballpark), and most importantly, birthday cake and ice cream. Thanks to the inspiring Christina Tosi at my favorite dessert joint, Milk Bar, birthday cake flavor has become quite the trend (I am a huge fan of her birthday cake truffles). This idea makes perfect sense to me, since I can be found at most celebrations combining ice cream and cake onto my fork to form the perfect bite. So I asked Keith to take his patented no-churn gelato recipe and lace it with delicious funfetti flavor. The result is our Birthday Cake Ice Cream that barely lasted a day in our freezer. It is amazing how such simple ingredients can yield such a fantastic desert. 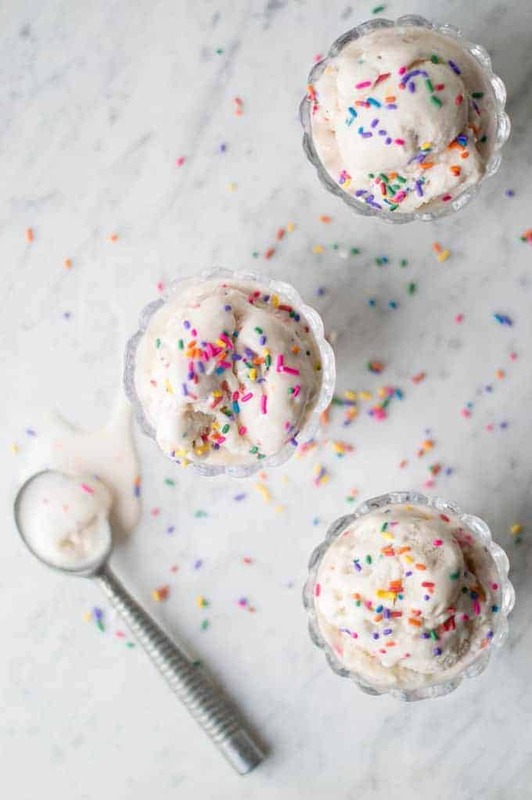 I definitely have a weakness for cake (and sprinkles), and one bite of this deliciously sweet Birthday Cake Ice Cream transported me back to summer birthday parties, back yard baseball games, and Slip N’ Slides. It was well-received at our house by kids and the grown-up kids alike. We ate it in cups, on cones, and with cake. I loved this stuff so much that I had to beg Keith not to make it again for a while (my diet was in serious jeopardy). This special treat is reserved only for birthdays, when indulging in great food and celebrating our loved ones is mandatory. Although an ice cream maker is not necessary for this recipe, an emulsion blender is. Get one here. 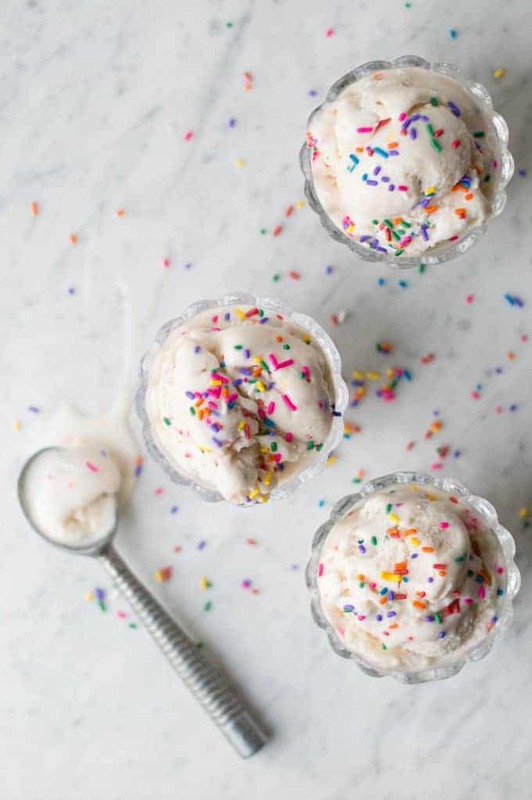 A no-churn ice cream that tastes like heaven and is so easy to make. The hard part is waiting for it to freeze. 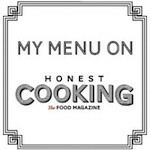 In a large metal mixing bowl, combine milk, cream, and sugar. Blend with emulsion blender until sugar is dissolved, about 4-5 minutes. Add the powdered milk and cake mix and continue to mix for 5-6 minutes until frothy and slightly thickened. Transfer to the freezer and allow to freeze for 2 hours. Remove and blend again for 5 minutes. Continue this step three more times. After mixing it 4 times, cover with plastic wrap by pressing plastic wrap down onto surface of ice cream. Place in freezer and freeze overnight. Remove from freezer and add candy sprinkles and mix in with heavy wooden spoon. Place in airtight container and freeze until ready to enjoy. It looks beautiful and so delicious, Jackie! Ice cream (or gelato) is one of our favorite treats, too! 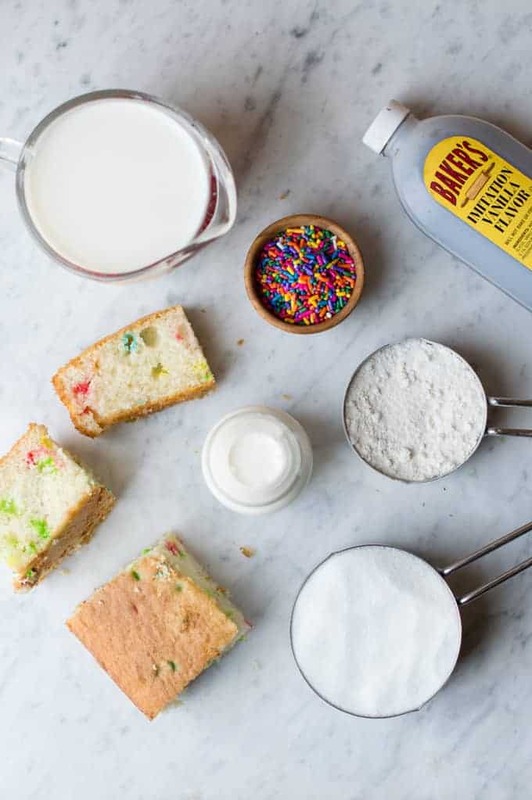 Combining it with sprinkles and the flavors of a birthday cake is like having all the best in one spoonful! Cake and ice cream all-in-one is so much fun! I’ve never tried the no-churn method before- so perfect if you don’t have an ice cream maker. I have such a hard time photographing ice cream… you did such a nice job on these!